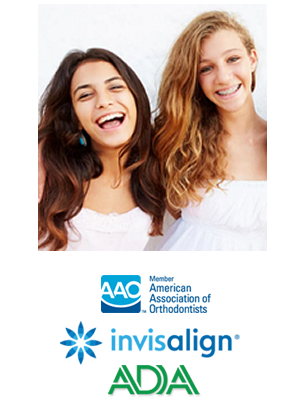 The American Association of Orthodontists (AAO) recommends that children be seen by an orthodontist by age seven. The first permanent molars and incisors have usually erupted by this time. Phase I Treatment, or early interceptive treatment, is limited orthodontic treatment before all of the permanent teeth have erupted. Phase I treatment can be of benefit in certain cases for significant tooth crowding, functional bite mismatch, or jaw growth disharmony. For most children and adolescents, there is an optimum time to begin treatment. Dr. Daub will recommend Phase I treatment if needed. For many children, it may be best to wait until all permanent teeth have erupted. Phase II Treatment is also called comprehensive orthodontic treatment. It involves full braces or upper/lower Invisalign aligners when all of the permanent teeth have erupted, usually between the ages of 11 and 13. Dr. Daub examines each individual to determine and customize his or her treatment plan. Orthodontic treatment can be successful at any age, and adults especially appreciate the benefits of a beautiful smile. One of every five patients in orthodontic treatment is over the age of 21. There are a variety of options available for adults including conventional braces, Invisalign, and clear braces. As long as bone, teeth, and gums are healthy, there is no age limit on pursuing the smile you’ve always wanted.